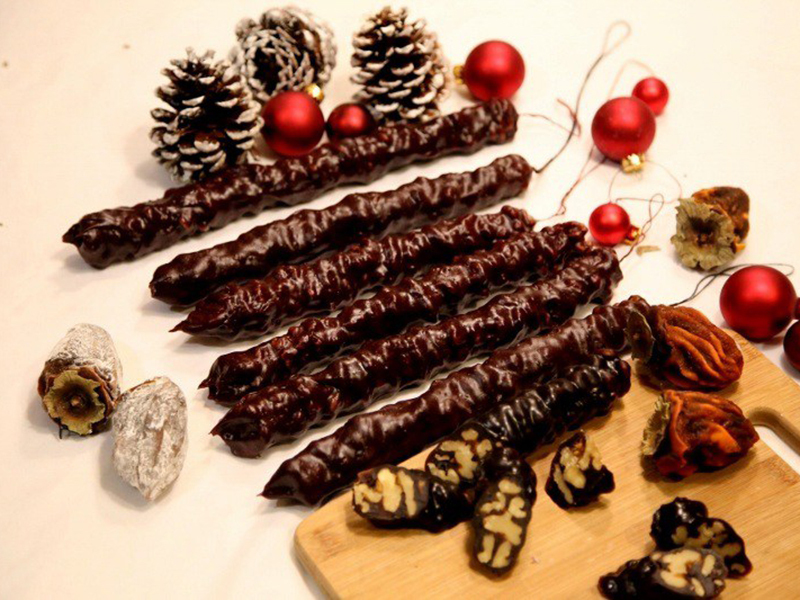 The South Caucasus' Best Kept Secrets: Its Sweets! - Holy Smithereens! 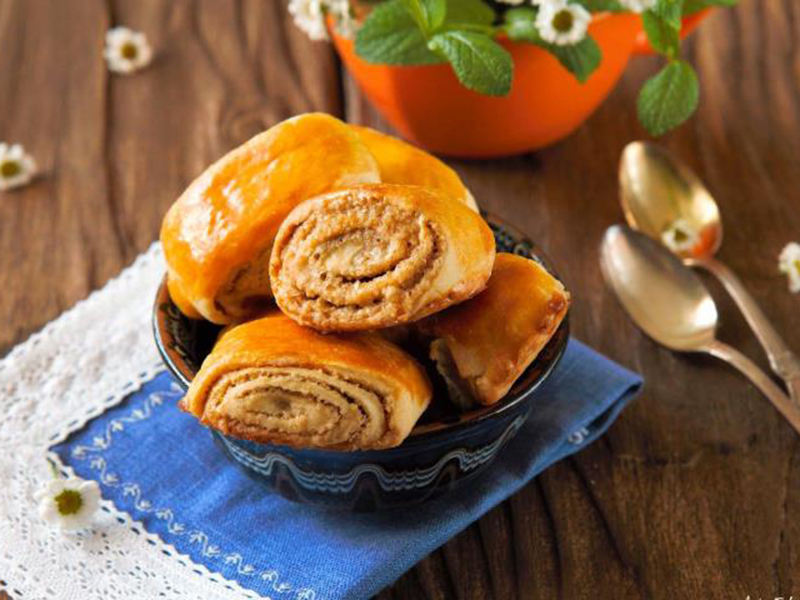 The South Caucasus’ Best Kept Secrets: Its Sweets! I’ve always been fascinated by the countries that make up the South Caucasus region – Armenia, Georgia and Azerbaijan. I know little of the region, so when I came across this BBC article explaining why Armenians love strangers, I knew I had to dig more. I found out that this region was a well-trekked thoroughfare along the Silk Road. Many merchants and traders have frequented and stopped by this region. So it probably explains why their sweets, much like their hospitality, is unforgettable. So this blog article is devoted to the amazing mouth watering Caucasian sweets. The South Caucasus region, namely Armenia, Georgia and Azerbaijan, is a real heaven for gourmets! Therefore it is not surprising that gourmet tours to the Caucasus are at the peak of popularity. Armenian national cuisine is very ancient and rich. In two words it can be described as very nourishing high calorie with a lot of meat dishes. Armenian sweets are no less diverse. Mainly, the country is famous for dried fruits and pastry. In Armenia, the preparation of each dessert is a whole ceremony that takes a long time and effort. That is why the result is perfect, and the taste is unforgettable. The most famous traditional Armenian dessert is gata. In ancient times, it decorated the royal festive tables, and to this day this sweet cake is considered traditional pastry on the festive table. 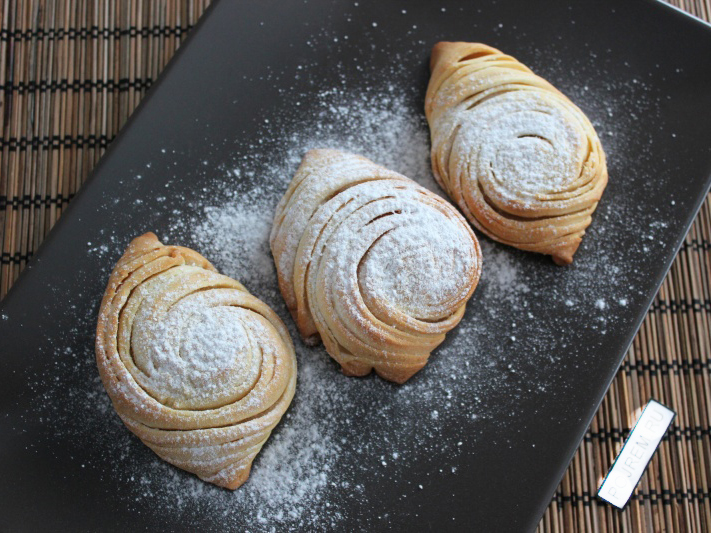 Gata is a puff pastry with sweet or salty filling called “khoriz”. Gata is cut into small rectangular cakes. The round gata is mainly baked for weddings. Gata has so many varieties. In each province, the dessert is prepared in its own way, you can find Stepanakert gata, Yerevan gata and round Garni gata. Armenian dried fruits definitely deserve your attention. Thanks to the fertile land and the sun, Armenian fruits are so sweet and juicy, and dried fruits are so healthy. 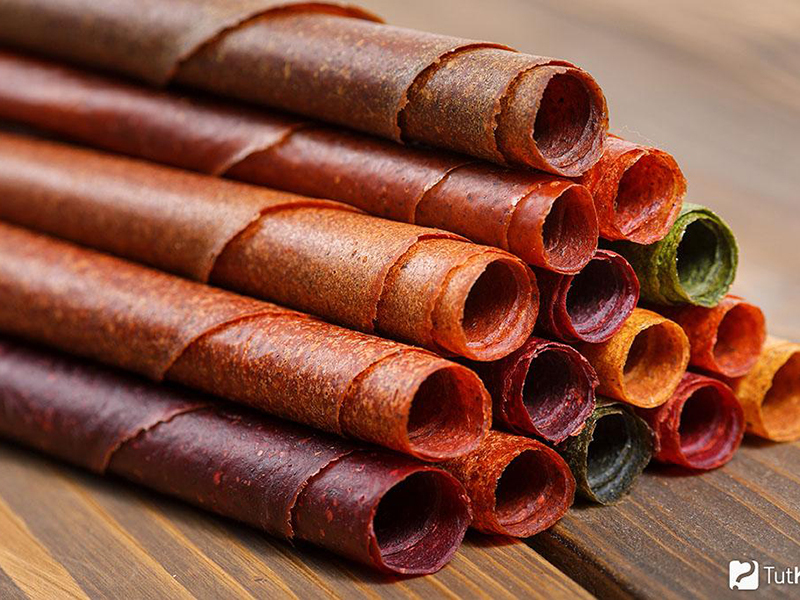 Traditional dried fruits are prepared without sugar, that’s why they preserve all the vitamins. Dried fruits are traditional sweets on the festive table. It is impossible to go by the colourful variety of dried fruits in a local market. They are arranged so attractively. From all the kinds of dried fruits, first, try alani that is a dried peach stuffed with nuts and cinnamon. People often confuse Armenian sujukh with Georgian churchkhela thinking it is the same dessert. Still, it’s not that simple. Churchkhela and sujukh are made from walnuts, but the taste and aroma depend on the ingredients of the syrup. Churchkhela has a fruity flavour due to grape syrup. Sujukh is more spicy and rich thanks to clove, cardamom and cinnamon. In addition, sujukh is softer like a marmalade with nuts, while churchkhela is more solid and difficult to chew. Every nation of Asia and the Middle East believe that pakhlava is its traditional dessert, and it is difficult to say which of them owns “copyright”. However, we can say for sure that pakhlava is unique in every national cuisine. Armenian pakhlava is very tasty, aromatic and nourishing. The process of baking traditional baklava is a whole ceremony. 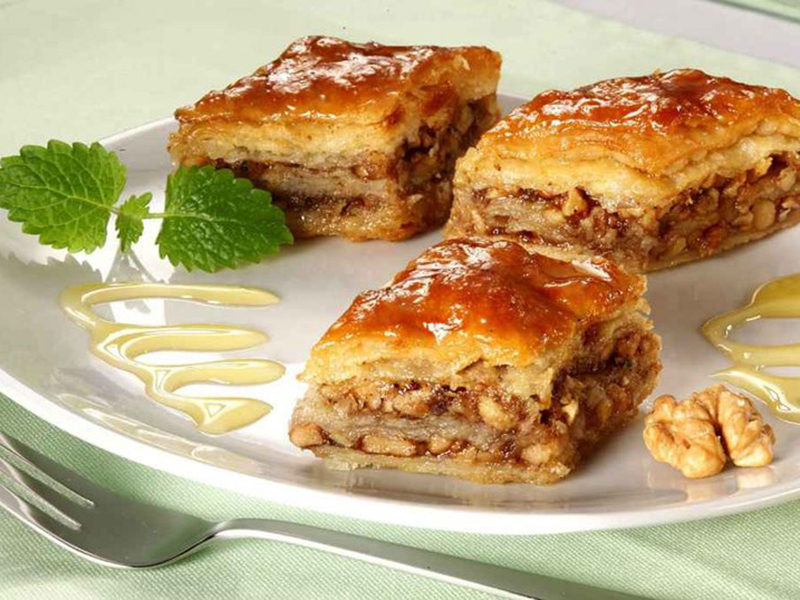 It is made of thin layers of dough, with honey and nut filling. Georgian sweets are very bright and colourful. The most delicious sweets are made from nuts and fruits because the country is rich in both. It means you can enjoy sweet Georgian fruits all year round both in fresh and dried form. Tklapi is an interesting dessert with no less interesting name. This is a sour thin lavash made from plums and dogwoods. Tklapi is sometimes added to meat dishes and fish sauces. 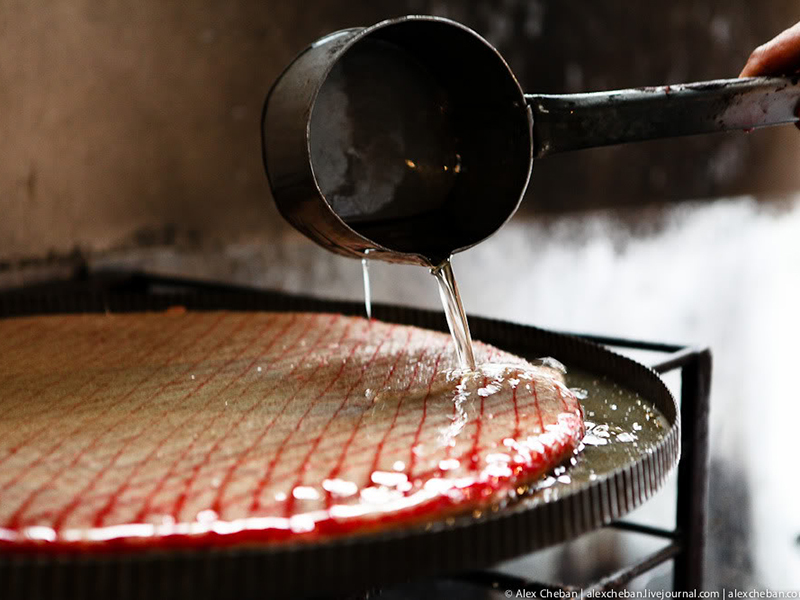 To prepare a sauce from tklapi, a piece of lavash is soaked in water and frayed to get the mashed sauce. Pelamushi is a popular dessert on the festive Georgian table. It is made from flour and grape juice. Porridge is filled into small moulds and put in the refrigerator. 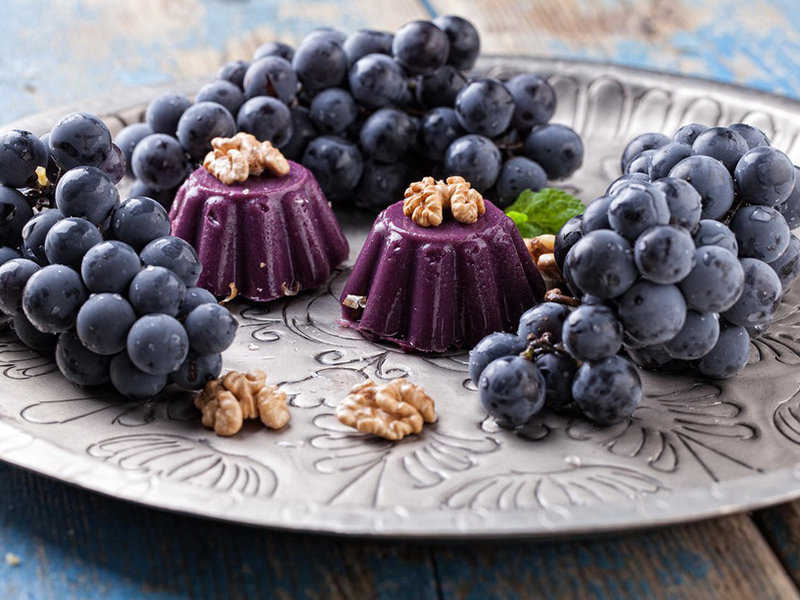 Before serving, the sweet jelly is decorated with nuts. Pelamushi made of red grapes is served for the holidays, and pelamushi made of white grapes is a traditional dessert at the wedding table. The most popular and definitely the most delicious traditional dessert in Georgia is gozinaki. It is the main dessert on the New Year’s table. Traditional Georgian gozinaki differs from the one you are used to buy from stores. 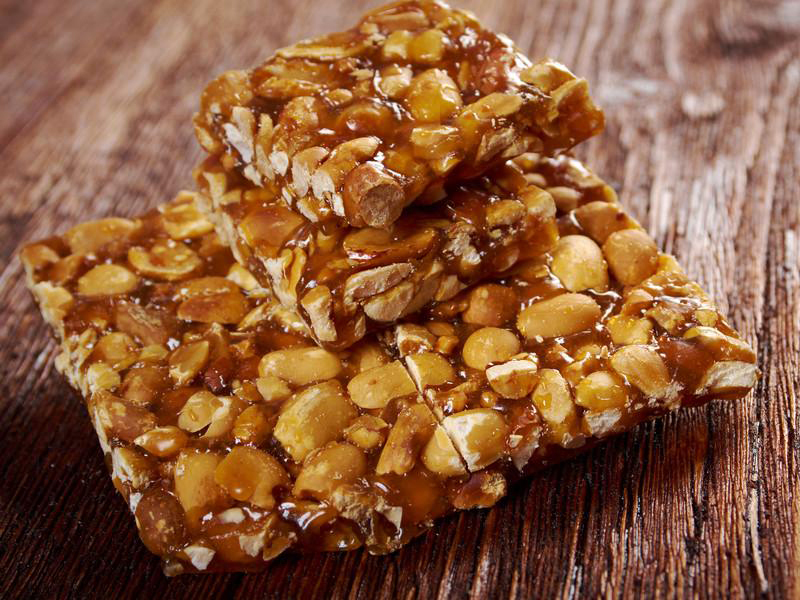 Georgian Gozinaki is made from walnut, hazelnuts, peanuts and honey. Gozinaki is a very useful and nourishing dessert. You can hardly resist the second piece; still do not forget to watch your figure. Churchkhela is a sweet sausage made from nuts and a sweet syrup. It is a favorite dessert for locals and guests. Traditional churchkhela is made from walnuts and hazelnuts. Churchkhela is covered with grape juice and flour. Churchkhela is usually prepared in the fall, at harvest time. It is left for a few days so that the jelly becomes completely dry and solid and only then you can taste it. Azerbaijani cuisine is quite diverse. 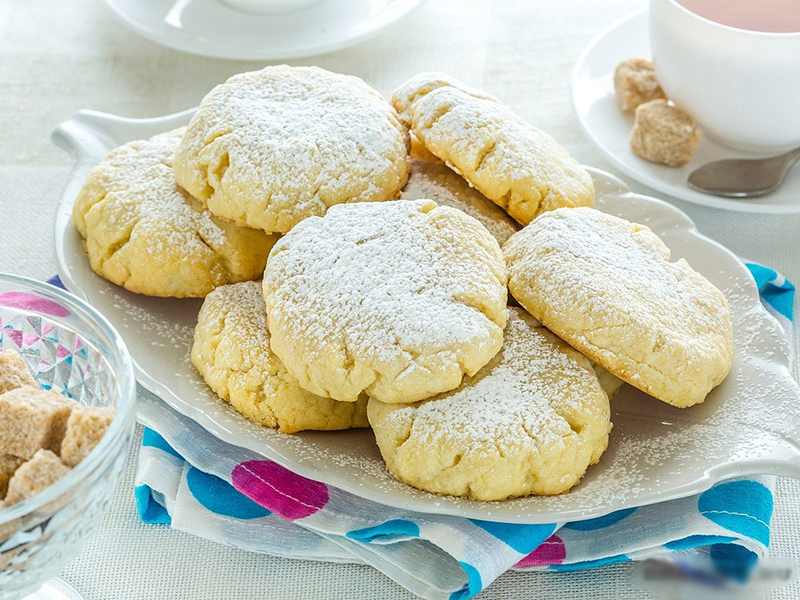 Shaker Bura or Shekerbura is a yeast dough cookie with a sweet filling of sugar, spices and hazelnuts. This dessert is also prepared in Turkey and Armenia. The crescent-shaped cookie is decorated with patterns in the shape of the ear of wheat. Traditionally, Shaker Bura is baked on Novruz holiday. Badambura is another sweet cookie with nut filling, dusted with powdered sugar. Cardamon makes it flavored and so appetizing. Badambura is a wonderful dessert for traditional tea drinking. 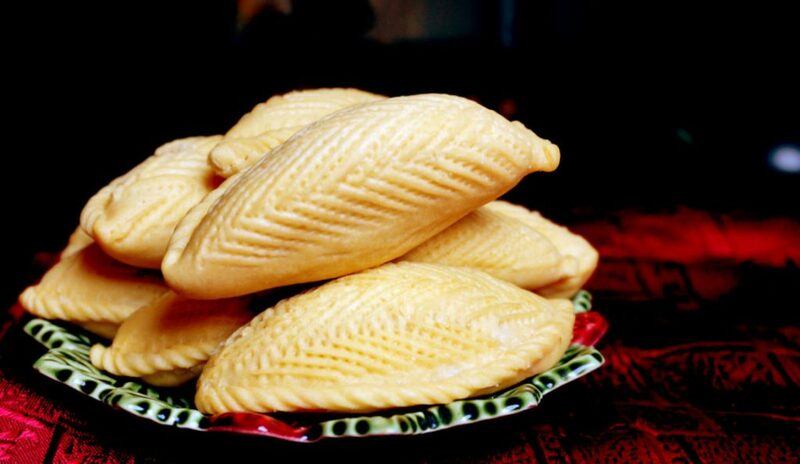 Shaker-churek is very sweet and sugary cake. It is made from ghee and powdered sugar, this is why it is so filling. All traditional Azerbaijani sweets are perfect for tea, and for every day spent in Azerbaijan you can try a new type of traditional cookie. You can taste Sheki halvah only in Azerbaijan. The process of making halvah is rather complicated this is why it cannot be replicated at home. Traditional halvah is prepared for the Novruz holiday and it is a must on the festive table. Have you tried any of these sweets? Have you been to the South Caucasus? Wow, it seems delicious! Thanks for sharing!